Whether it is the Sandy Hook shooting, the Las Vegas shooting, or, now, the Marjory Stoneman Douglas High School shooting, the response is always the same. Chip, chip, chip away at the Second Amendment, as if more laws will prevent bad people from doing bad things. So far this year, there have been 391 people shot and wounded and 91 killed in Chicago, a city with some of the toughest gun laws in the country. Where is the outcry for those shootings/killings and innocent lives taken? I never hear anyone on the Left talk about this to the degree that is expressed every time there is a school shooting. Considering the vast number of people involved in these shootings are black, can we then conclude the Left is racist, something the right is accused of on a daily basis? At the time of the Marjory Stoneman Douglas High School shooting, the cable networks reported on the story 24/7. In sharp contrast, the armed resource guard who shot and killed the shooter as he began his rampage at the Great Mills High School in Maryland this month, preventing a far worse tragedy, was overlooked on the CNN and MSNBC websites and I saw about 15 seconds of lip service given to the story on Fox News. The loudest cries for gun control come from the hypocrites in Hollywood who’ve made millions making movies depicting gun violence and have probably spent millions of dollars for their own armed security guards. Yet, they don’t want me to defend myself. Most recently, these same loudmouths were the recipients of the valuable time of the Los Angeles Police Department – 500 strong – to protect them while they displayed their naiveté at the Academy Awards. Exactly how much money did these clueless celebrities donate to the police officers’ benevolent society as a “thank you” for this protective manpower? And, of course, there’s the National Rifle Association, which the Left would like to destroy and everything it stands for – safety and the Second Amendment. Do they even know anything about the NRA? Exactly how many of the criminal shooters have been members of the NRA? I have no doubt that the far Left would be ecstatic if there was no Second Amendment. Until they’re able to accomplish that, I have absolutely no idea what goes on in the mind of someone who thinks that if you remove guns from society, we will automatically live in Utopia. Bad guys are bad guys for a reason. They don’t follow rules. They commit crimes. They don’t care about laws. The notion that removing guns will solve all of society’s ills is either naive or just plain stupid. The idea we can legislate evil away is absurd. When drunk drivers kill innocent people while driving, where is the outcry to ban cars? When terrorists drive trucks into crowds of innocent people, where is the outcry to ban trucks? When terrorists create bombs that kill innocent people, where is the outcry to ban fertilizer? Plumbing supplies? Nails? Pressure cookers? When kids are bullied online and driven to suicide, where is the outcry to get rid of Facebook? When terrorists fly planes into buildings and kill thousands of innocent people, where is the outcry to rid the skies of airplanes? When terrorists cut off the heads of innocent people, where is the outcry to outlaw machetes? Knives? When arsonists kill innocent people, where is the outcry to ban matches? What the Left in this country continues to disregard and fails to recognize is that EVIL exists and is behind all these actions. These are conscious decisions to act, and, if that’s someone’s intent, they will find the means to do it – no matter what the law says. 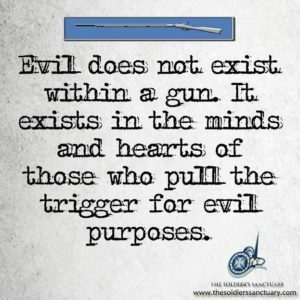 EVIL does not exist in inanimate objects. EVIL exists in people. In my opinion, EVIL is ignored because it requires a judgment call and, of course, the Left doesn’t want to be judgmental. Belief in God is waning while moral confusion is on the rise, particularly among young people. Anonymity is protected on social media which has allowed incivility to increase and empathy to decline. Personal interaction has decreased. Does the notion of right vs. wrong even exist today? I’ll leave all this to the sociologists and philosophers. When EVIL has been eradicated from the face of the Earth, I’ll gladly turn in my weapons. Until then….